Gazebos can offer a touch of style and charm to any backyard. Perhaps that’s why they have enjoyed such a long tradition and have been the centerpieces of many historical locations and cultures. The Bom Jesus do Monte Gazebo –Located in Tenoes, Portugal, the Bon Jesus do Monte has been the destination for religious pilgrims since it was first built in 1811. It is located in a sanctuary garden in the shadow of a famous Portuguese church and is believed to have miraculous healing powers. The Gazebo at Hallbrunn Palace — While this particular gazebo located in Salzburg, Austria, may not be as elaborately decorated as others on this list, it probably is the most familiar to the average person … especially if they have ever watched the movie “The Sound of Music”. That’s because this gazebo is where the famous musical sequence featuring the song, “I am Sixteen Going on Seventeen” was filmed in the early 1960s. The Gazebos at the Hampton Court Palace Flower Show — Special futuristic gazebos were built for this flower show held annually in London, England, that featured modernistic glass pods and other high tech design. The Tropical Palm House — Located in the Royal Botanical Garden in Edinburgh, Scotland, this famous giant-sized gazebo was built in 1834 and is large enough to accommodate more than 2,600 different species of palms. The Hanging Gardens of Babylon — Scholars debate whether this historically famous gazebo structure ever actually existed, but if it did it was built in what is now modern day Iraq during the First Century. 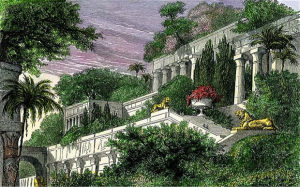 Known as one of the Seven Wonders of the Ancient World, the hanging gardens probably didn’t actually hang, but featured plants and vegetation that draped over the gazebo’s fixed brick structure.